This page is just beginning--do you have anything to contribute to it? If so, tell us! 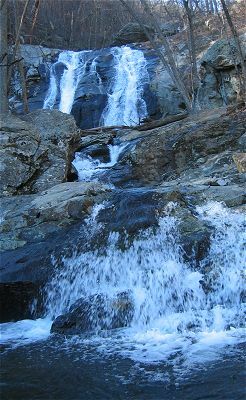 Getting to Whiteoak Canyon Falls is a pleasant, brief hike. To get to the trailhead, take the Rapidan Road back to 670, but instead of turning right to go toward Criglersville, turn left to go toward Syria. Turn right at the Syria Mercantile onto VA-643, and then left on VA-600. After an extremely scenic drive, you’ll see a sign for parking for the Whiteoak Canyon Trail. Like Old Rag—the #1 hike in the area—the parking lot fills on busy summer weekends. Jones Mountain is a more strenuous hike, but has extremely rewarding views at the top from Bear Church Rock. It starts from from the Rapidan Road, along the the Graves Mill Trail—which until Hurricane Fran in 1997 was the road into Graves Mill. Hike to Big Meadows via Camp Hoover. There are two trails from Camp Hoover to the Big Meadows facility along Skyline Drive; each trail is about 3 miles (plus the distance from our cabins to Camp Hoover). The Mill Prong and the Laurel Prong Trails are each very nice—try a round trip up one and down the other.